Asha has always been known for having such a zest for life. She was feisty, with a brightness about her that always shined. You would think that, being so assertive with humans, she would be the dominant lion in her pride. Instead, she would take Shanti Deva’s lead on how to approach their daily routine. Enamored with Aslan, she followed him constantly. Asha was such a vocal lioness, communicating very clearly what pleased and displeased her. Since she never hid her emotions, we knew exactly what she loved. And how she loved meal time! Belly rolls with Aslan and curling up for a nap with Shanti Deva also topped her list of favorite things in life. Being so bold and assertive, it was very obvious when things weren’t quite right for Asha. You could see her eyes dim slightly and a calm set over her. Almost a year and a half ago, we knew so mething was dangerously wrong. Asha underwent emergency surgery for a mass on her liver and slow motility that caused a blockage in her intestines. Amazingly, 14 inches had to be removed from her colon. We breathed such a sigh of relief when Asha recovered fully. She returned to her feisty self, thanks to the love of her pride. Life was good again for them. She would roll with Aslan and chase Shanti Deva as caretakers passed by. Even though Asha said good-bye to her love Aslan earlier this year, she stayed strong in spirit. She found comfort in Shanti Deva who has always been the calming presence amongst the pride. We took comfort that Asha’s bright zest for life continued, even with his loss. But recently, we saw a little bit of that zest dim. It was different this time. We knew there could be no more emergency surgeries for this 19 year old lioness. She had bravely conquered all she could. She was a little quiet, slept more than normal and was picky with food. An exam confirmed another mass in her abdomen and depleted red blood cells that were not regenerating. It’s never an easy decision, but we knew that this strong lioness deserved to go bravely, before her light faded further. With heavy hearts and tears, we did the most humane and difficult thing we could, we chose not to wake her up from sedation and allowed her to join Aslan. We’re sure Aslan met her with belly rolls and nose nudges. Saying good-bye to her was sudden, but it’s what we had to do. We had to do it for her. Shanti Deva, the alpha of the pride, still resides over their habitat. She seemed to know it was time for Asha to join Aslan, even before we did. She continues to be calm and social with her caretakers. She remains very active and still loves to roar at her caretakers as they drive by after feeding. It’s hard to get used to her single roar, when we’ve been used to the roaring chorus of the entire pride. But her mighty roar is a symbol of how strong she is and that she continues their legacy here at The Wildcat Sanctuary. We will love and pamper her here until it is time for her to rejoin Asha and Aslan as alpha of their pride. 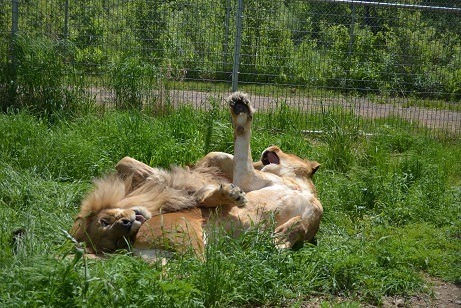 Asha and two other lions were part of a big cat rescue from the Catskill Game Farm in New York just before Christmas 2006. With the closure of their animal park, the game farm auctioned off 950 animals, making both East Coast and national headlines. Asha was born in 1996. After healing from her physical and emotional scars from her confinement at the game farm, Asha has blossomed into a very jolly cat. She loves all kinds of enrichment that keepers give her including boxes to shred, pumpkins for Halloween, and anything heavily scented like perfume sprayed on her toys. Asha and Aslan shared a special bond before he passed away in 2014 and often groom each other before mealtime or roll down the hill together like old pals. Most of all, Asha loves relaxing. In her hammock, on her cave or just lounging in the grass, she thinks being a lazy lion is great! You can help provide daily care for Asha by becoming her sponsor. Your generosity will be greatly appreciated. In December of 2013, Asha became gravely ill. Nothing else matters when one of our beloved cats falls ill. For a moment, you feel helpless, but it also brings clarity. Clarity that this is what all the hard work is for – to help cats like Asha. Our founder, Tammy Thies, shared, “I can remember the first day Asha arrived at The Wildcat Sanctuary. It was a cold and snowy winter day, much like today. She was in a large metal crate being lifted from a truck with a skid steer. Both the crate and the skid steer were rocking from her shifting side to side. Even through the crate, you could sense the sheer power of her. She was such a strong girl. She has been a strong girl every day since joining our sanctuary in 2006. That is until recently. Even at 17, Asha has been an active lioness. Meal time is her favorite time. So, when she wasn’t as interested in eating one day, we knew something was wrong. Seeing one of our strongest cats appear weak is very emotional for each of us, but we know we have an important job to do. And, with wild animals, it often must be done quickly. Taking a 400-pound lioness to the vet isn’t an easy task or inexpensive, but your support ensures big cats like Asha always receive the best of care. TWS vets sedated and examined Asha at the Sanctuary. She was given pain medications, fluids and supportive care here at TWS so she would be stronger for her trip the next day to the University of Minnesota’s large animal hospital for diagnostics. The University’s expert team performed ultrasounds and it was determined surgery was needed. Asha had a baseball size benign cyst on her liver and a blockage in her lower intestine due to slow motility. Results showed this had been an ongoing issue for Asha. Surgery took several hours and then she was on her way back to TWS for recovery. Asha received around the clock monitoring and care by her keepers, including medication and a special diet. Two weeks after her surgery, she was introduced back into her pride with Shanti Deva and Aslan. The reunion and recovery was just as emotional for us as her illness. Seeing the pride accept her back and immediately begin grooming her was heartwarming.